Q: What does innovative teaching look like? A: Innovation is a popular buzzword in education. Teachers all over the world are encouraged to be innovative and encourage their students to pursue innovative ideas and be innovative in their thinking. Q: Tell us about your journey; what inspired you to write your books? Q: What led to the framework? A: Conversations with teachers. Helping teachers become re-engaged. Leaving the classroom for a tech integrator role, working in different schools. A: Common vocabulary can build climate and culture. George Couros – new, different, and better. Q: What does your ideal PD opportunity look like? How do you go about receiving personal and professional development? 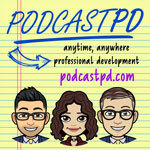 Chris: Teachers Need Teachers Kim Lepre, Teachers Need Teachers is the podcast for new and beginning teachers. It’s inspired by the questions beginning teachers are asking around the web, plus the questions that you didn’t know you should ask! Stacey: Deck the Hallmark Join Bran, Panda, and Dan as they attempt to watch and review all 37 Hallmark Christmas Movie premiers this holiday season. Bran LOVES Hallmark movies, Panda LIKES Hallmark movies and Dan DESPISES Hallmark movies. Start with PREVIEW 1; Rocky Mountain Christmas and be sure to check out their site!